Note to readers: I have been unable to find a good publicly-available diagram of the brain that would illustrate most of the areas discussed in this section. Students who have access to a library can find a good brain diagram on p.53 of Robert Sternberg's book Cognitive Psychology, 5th international edition, published by Cengage. The human brain is often characterized as consisting of a forebrain, midbrain, and hindbrain. These terms relate to the front-to-back arrangement of structures in the developing embryo, although during the course of development the positions change so that the forebrain is essentially sitting on top of the midbrain and hindbrain. The forebrain consists of the cerebral cortex, the basal ganglia, the limbic system, the thalamus, and the hypothalamus. The cerebral cortex is the outer layer of the brain and is just a few millimetres thick. It is involved in memory, attention, language, thinking, and voluntary movement. In humans, the cortex is bunched up into convolutions which enables a greater area to be enclosed within the skull. The surface of the cortex consists of unmyelinated gray neurons, which is why this part of the brain is sometimes referred to as gray matter. The interior of the brain consists of myelinated neurons that are referred to as white matter. The basal ganglia are particularly involved in motor control and learning. 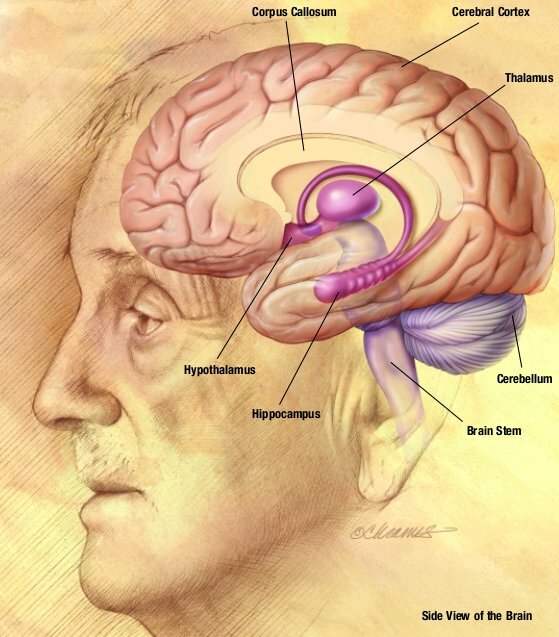 Deficits in this area have been linked with Huntingdon's disease and Parkinson's disease. The limbic system is associated with learning, memory, emotion, and motivation. It consists of the amygdala, the septum, and the hippocampus. The amygdala is involved in the processing of emotion, especially anger and aggression, and the septum is involved in anger and fear. Some researchers consider the amygdala to be part of the basal ganglia. Lastly, the hippocampus plays an important role in memory formation. Damage to the hippocampus is associated with deficits in declarative memory, but not procedural memory. In particular, hippocampal damage is associated with the inability to create new long-term declarative memories. The thalamus has multiple functions. One function is to process sensory information and relay it to the cortex. Other roles include involvement in the regulation of sleep and waking, and regulation of awareness. The hypothalamus interacts with the limbic system and is involved in the regulation of hunger, thirst, temperature, and emotion. The midbrain contains a number of structures, including the superior colliculi, which is involved in vision; the inferior colliculi, which are involved in hearing; and the grey matter, red nucleus, substantia nigra, and ventral region, which are all important for the control of movement. Another structure, the Reticular Activating System plays an important role in regulating consciousness, including sleep, waking, heartbeat, and breathing. The hindbrain also consists of several structures. The medulla oblongata controls heartrate and is also involved in the control of breathing, swallowing, and digestion. The pons relays messages between different parts of the brain, in particular sensory messages between the cerebellum and cerebrum. The cerebellum is involved in integrating sensory perception, and controls bodily coordination and balance. The three main structures just described, the forebrain, midbrain, and hindbrain, evolved in different periods of human pre-history. In the womb, the development of these structures roughly corresponds to their evolutionary development. The hindbrain is the oldest part of the brain in evolutionary terms and the first to develop prenatally. The midbrain evolved after the hindbrain and is the second structure to develop prenatally. Finally, the forebrain is the most recent evolutionary addition and is the last to develop prenatally. Note also that the oldest parts of the brain tend to deal with the most basic functions, such as breathing and heartrate, and they are the least susceptible to damage. People who suffer brain damage, whether as a result of an external impact or from a stroke, often lose some cognitive function but nonetheless remain able to eat, sleep, and breath. Having trouble remembering which bits of the brain do what? The following two videos show how you can use visual strategies to link structures and functions1. Not all structures are mentioned, but having watched these you might be able to invent your own memory links. 1. I am grateful to Danny Daniels for drawing these to my attention.